As the dust settles on the 2018 midterm election, one thing becomes increasingly clear. The winner this year was not a party or a candidate; the winner was democracy. From Ranked Choice Voting (RCV) to anti-gerrymandering initiatives to historic, comprehensive anti-corruption reforms, 2018 broke the record for the most anti-corruption reforms passed in one year. Despite the divisiveness of modern politics, conservatives, progressives, and everyone in between remain united on our country’s founding values: democracy, fair representation, and equal opportunities to make our voices heard. The North Dakota Anti-Corruption Amendment, which sets up tough new ethics laws and dark money disclosure. March: Automatic voter registration passed in Washington. Tempe voters passed a dark money disclosure. May: Ohio voters passed an anti-gerrymandering initiative by a 50-point margin, backed by Republicans (including Gov. John Kasich) and Democrats. June: Maine voters successfully protected ranked choice voting. July: Alaska passed a sweeping anti-corruption package. You can learn more about each of these amazing, grassroots-led stories here. With a total of 23 wins over the course of the year, 2018 is now the biggest year in American history for election reforms. These wins create lasting change that will help unrig our broken political system. Ranked Choice Voting gives voters more choice and voice in elections, and encourages civility in politics by making candidates compete for your second and third choice rankings. Gerrymandering reforms restore voter power by ensuring that voters choose their politicians, instead of the other way around. Common sense dark money and lobbyist reforms bring needed transparency and accountability and close the revolving door between legislators and lobbyists. Each of these campaigns brought together unlikely allies and proved that anti-corruption is not only an issue that reaches beyond partisanship, but that party politics is not as simply divided as it seems. The campaign that passed North Dakota’s historic anti-corruption amendment was led by self-described “Badass Grandmas” Dina Butcher, a Republican, and Ellen Chaffee, a Democrat. In Colorado, Amendments Y and Z garnered support from former California Gov. Arnold Schwarzenegger (R) as well as Colorado Gov. John Hickenlooper (D). 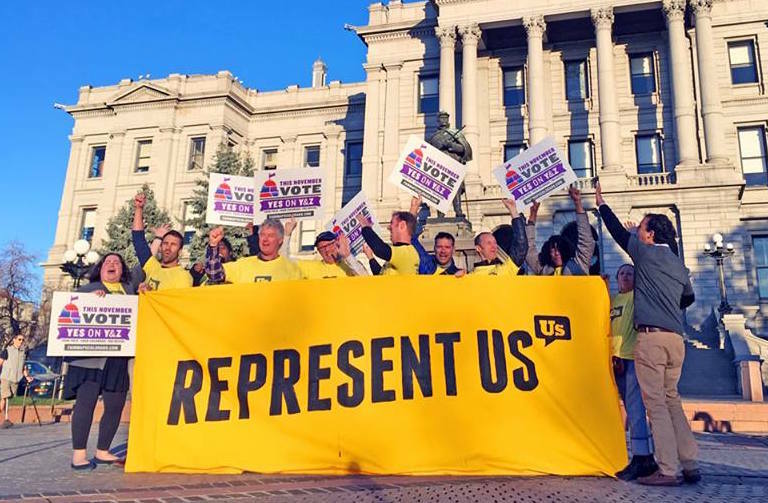 What’s more, the “Yes on Y and Z” campaign was run by Fair Maps Colorado, an organization created when two earlier campaigns from opposite ends of the political spectrum decided to put aside their differences and work together for a common goal. The measures were certified for the ballot in early May with unanimous votes from the House and Senate. Over 70% of Colorado voters approved the amendments. In Missouri, Republican State Senator Rob Schaaf — a member of the RepresentUs Advisory Council — worked closely with St. Louis Treasurer, Democrat Tishaura Jones to create “What a Democrat and a Republican Can Agree on,” a video that highlighted the need for unity in cleaning up our government. These ballot measures prove that the real divide isn’t about left-versus-right. It’s about power and money versus the will of the American people. Across these campaigns, Republicans, Democrats, and Independents worked together to pass common sense reforms, and were opposed not by a particular party, but by those who feared losing their suffocating grip on power. Power, not partisanship is what is truly dividing the country. This past year, Americans proved that they’re ready to take back their power. The 23 winning 2018 anti-corruption ballot measures inspire hope. They prove that people from across the political spectrum can work together to make change, and they prove that our strategy is working. Our strategy is built around the idea that winning state laws will build towards federal reform. It’s a strategy for change that has worked throughout American history, many times over. Twenty-seven states passed laws giving women the right to vote before it passed federally. Thirty-four states legalized interracial marriage before it became federal law. The list of examples goes on, and the takeaway is clear: passing state laws is an essential catalyst for winning sweeping federal reform on fundamental issues. Indeed, federal legislators are taking notice. Just recently, Republican U.S. Sen. Ben Sasse (Nebraska) has already filed several bills to “Drain the Swamp,” and Democrat U.S. Sen. Elizabeth Warren (Massachusetts) has filed an anti-corruption bill. This year has been inspiring and successful, but our work is far from over. We must continue to advance common sense solutions that improve government from end to end: how we run elections, how laws are made, and how those laws are implemented. We must hold the new congress accountable, and ensure that they follow through on the anti-corruption and good government policy promises they’ve made. RepresentUs members will be here every step of the way, putting country over party to unrig the system and powering the powerful grassroots movement sweeping the nation. This is the first wave of wins at the ballot, and we’re prepping for even more success in 2019 and 2020. You can join the movement by volunteering with your local RepresentUs chapter and by joining The Common Wealth and making a monthly gift of any amount that works for you. 100% of Common Wealth funds go straight to the front lines of anti-corruption campaigns, not to administrative costs. Your support will fuel this movement. Thanks for celebrating these victories for the movement and joining us in fighting for more. As Grassroots Communications Manager for RepresentUs, Ellen works to amplify the voices and stories of local members and chapters that are building dynamic coalitions across the US, combating corruption in their communities, and fighting for a better world for us all.